Suzuki Airi was born on April 12, 1994 in Gifu, Japan to Suzuki Toru andKyoko, and raised in Chiba prefecture. At age 6, Suzuki began attending Up-Front Music School, and was a student until she joined Hello! Project Kids at age 8. On June 30, Suzuki Airi participated in the Hello! Project auditions to find singers to form Hello! Project Kids. Along with 14 other girls, Suzuki passed the audition after she performed “Kimochi wa Tsutawaru” by BoA. She made her first appearance in the entertainment industry as a member of4KIDS, a temporary group that appeared in Minimoni’s movie Minimoni the Movie Okashi na Daibouken! Suzuki was chosen as a member of a new Hello! Project unit named Aa!alongside Morning Musume member Tanaka Reina and fellow Hello! Project Kids member Natsuyaki Miyabi. The group released their first and only single, FIRST KISS, in October of the same year.The group later disbanded, but occasionally reunited to perform live, though Tanaka was no longer a member of the unit. Late in the year, Suzuki took part in her first Hello! Project shuffle unit, H.P. All Stars, taking part alongside all the members of Hello! Project at the time. The shuffle unit released one single and became inactive by January 2005. Suzuki Airi was assigned as a member of Hello! Project group ℃-utealongside seven other Hello! Project Kids members. These seven members had been passed over when it came to the forming of Berryz Koubou, which had originally been formed to teach the Hello! Project Kids about being in a group by rotating the line-up amongst the kids. ℃-ute started off releasing singles on an indie label, but made their major debut in 2007. On February 21, ℃-ute released their major debut single, “Sakura Chirari.” On the first day in the charts it ranked third on the Oricon charts, a feat not even accomplished by Hello! Project’s mother group Morning Musume (who had ranked 6th on their debut single). With their debut single, they became the youngest group (with the average age of 13) to rank in the top 10. They released three singles that year, with Suzuki being the lead vocalist and center focus for all three releases. On April 23, Suzuki Airi joined the Gatas Brillhantes H.P. futsal team. It was on July 21, that Suzuki would participate in a new unit named Buono! with Tsugunaga Momoko and Natsuyaki Miyabi from Berryz Koubou. On December 30, ℃-ute was chosen for the Best New Artist Award with Japan Record Award. Suzuki, along with four other members of ℃-ute and Berryz Koubou, left the Hello! Project futsal team, Gatas Brilhantes H.P.. The members left of their own violition due to feeling that they could not perform as high level players due to their level of ability. On March 13, Suzuki appeared solo in a Pizza-La commercial. This was her first time ever appearing on a Pizza-La commercial without the other Buono! members. On July 17th, Suzuki appeared in her second solo Pizza-La commercial. Her commercial was a Suzuki Airi version of Buono!’s commercial for Pizza-La’s French Camembert Cheese. In July, it was revealed that Aa! would be revived and it would include two original members -Suzuki Airi and Natsuyaki Miyabi- and a Hello! Pro Egg (Saho Akari). At the end of October, Suzuki appeared on the cover of the December issue of UP to boy magazine, together with Watanabe Mayu from AKB48. That was the first gravure collaboration between AKB48 and Hello! Project. Suzuki starred in the horror film Keitai Kanojo. Keitai Kanojo was a movie based on the popular mobile phone novel of the same name. It was a sequel to Keitai Kareshi, and Suzuki played a high school student investigating the mystery behind a mobile phone dating simulation game in the movie. Suzuki and Tanaka Reina starred in the horror film Vampire Stories. Suzuki, along with the other members of the Hello! Project Kids, starred in the horror filmOusama Game as the character Iwamura Ria, one of the main characters in the film. Suzuki, along with the other members of Buono!, starred in the horror film Gomennasai as Hidaka Yuka, one of the main characters. On April 18, it was announced that Suzuki Airi, Mano Erina, Yajima Maimi and Okai Chisatowould star in a new stage play titled Theatre in the Round. The stage play ran from May 15-17. Suzuki appeared in a drama on Nippon TV called Piece. The first episode aired on October 6. On Novemeber 18, Suzuki appeared in her third solo Pizza-La commercial. On December 8, Suzuki appeared in a Pizza-La commercial with Mari Sekine. Suzuki Airi and Wada Ayaka were in a special gravure book titled “Graduation ~Koukou Sotsugyou~.” The book was about graduating high school and was released on February 27. On March 2nd, it was announce at SATOYAMA e Yukou ~Forest For Rest~ that Suzuki andSugaya Risako would be part of a new unit called Dia Lady. On April 5, Suzuki made her manga-ka (manga artist) debut. Her manga, which is titled Suuーsan, is a one-frame manga which includes hand-drawn and written characters. Suzuki’s work was posted on Sueisha’s Aoharu site. On April 12, Suzuki had her birthday event, titled “19 no Utagoe” (19の歌声; 19’s Singing Voice). On May 20, Suzuki released a collaboration book with Bea’s Up magazine’s hair & make up stylist, Eita. Bea’s Up is a beauty magazine listing make-up tips for daily life, centered on women. Airi appeared in it as Eita’s model. On November 16, Suzuki appeared solo on a Pizza-La commercial. This was her fourth solo appearance in a Pizza-La commercial. On April 14, Suzuki celebrated her 20th birthday. The special event was called ℃-ute Suzuki Airi Birthday Event 2014. The event featured a performance in Tokyo. On October 7, Suzuki announced that starting in 2015, she would be the new image chara for “Suzunoya,” a famous Kimono store featured in JUNON magazine. She already had a photo shoot. On April 12, Suzuki celebrated her 21st birthday. 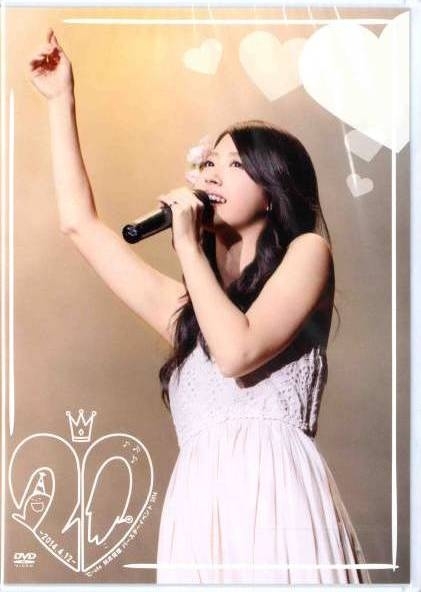 The special event was called ℃-ute Suzuki Airi Birthday Event 2015. The event featured two performance in Tokyo.